And so I came back to Coddenham after some fourteen years away. I hadn't meant to leave it so long. Here we are near the busy junction of the A14 and A140, but a sleight of planning hand leaves Coddenham untouched, a pleasing place of steep lanes and pretty cottages, but the sense of being a community. Coddenham is an old village. The layout of the streets reflects this; theres something not quite right about it. The blind corner opposite the shop was not meant for modern traffic, and the way the roads twist out of the village and into the fields seems stubborn, as if they do not want to conform to the needs of the modern world, but prefer to reflect something that was before, and is now gone. It may be that this is something to do with the fact that Coddenham was almost certainly the largest Roman settlement in Suffolk, at a time when what are now the towns of Bury and Ipswich were just hamlets, and Lowestoft probably did not even exist. A big clue that things were not always the way they are now is the 15th century porch on the side of St Mary. 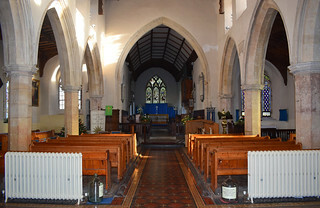 Instead of being perpendicular to the north aisle, as is usual, it is uniquely angled to face up the village street, at about sixty degrees to the north wall. At one time, the purpose of the street must have been simply to take the Faithful into the body of the church. Now, it approaches as before, but suddenly veers away wildly around the churchyard and down the hill towards the A140. At one time, liturgical processions must have used it, but it isnt clear if it was the Reformation which dictated the change in its direction, or a pressing need for villagers to get to Hemingstone in a hurry. Coddenham was an important place on the eve of the Reformation. 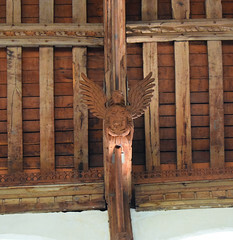 The clerestory is one of the most beautiful in Suffolk, particularly because it is not very long. 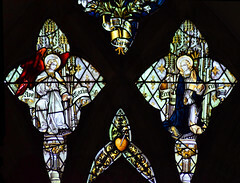 It rises like battlements of lace, and the inscription reads orate pro animae Johannis Frenche et Margaret ('Pray for the souls of John and Margaret French'). At the east end of the north aisle is a gorgeous fat red-brick rood stair case, that obviously postdates the windows either side of it. Another curiosity is that the tower stands at the end of the north aisle, so this was probably the site of the earlier church. The 15th century brought the new nave with its glamorous aisles and the soaring clerestory, but this must have been a small church once, and the nave is now as wide as it is long. The former tower archway is blocked, but there is a little door set in it. 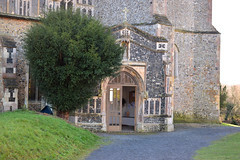 The angled porch was restored by that great anglo-catholic artist Ernest Geldart in the 1890. You step through it into a wide, urbanised nave, very much the product of an earlier 19th century restoration by E F Bishopp under the watchful eyes of diocesan architect Richard Phipson. 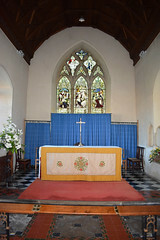 Beyond it, Geldart's restoration of the vast chancel stretches so far that it doubles the length of the church; it had been largely rebuilt in 1840, and then was extended in 1893. It was clearly meant as a statement that sacramental liturgical practices were back. The internal glory of St Mary is undoubtedly the roof. 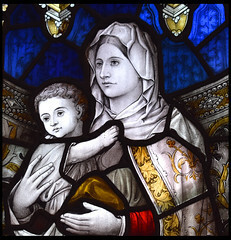 It is very late medieval, probably 15th century, but Mortlock thought it might be 16th century. Bishopp restored it. 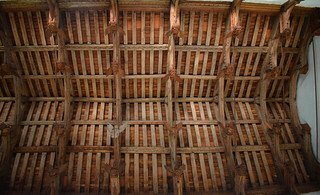 It is an unstained double hammerbeam roof, not quite so steeply pitched as is common in Suffolk. Angels gaze down from the gloom. There are plenty of hatchments, for those who like that kind of thing, mostly to the Bacon family, one of Suffolk's most significant landed families. 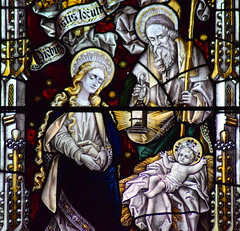 They also have a number of memorials, and the east window, a pleasing scene of the Nativity designed by Ernest Geldart, was produced by Percy Bacon & Brothers. 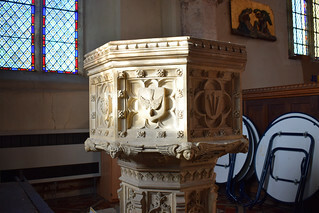 The font, reset in the north-west corner of the nave, was the 1890s work of Phipson's successor, Herbert Green. High out of reach in the top of the rood loft stair is a remarkable pre-Reformation relief of the crucifixion. 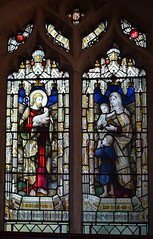 Almost certainly, it was part of a larger piece, perhaps a reredos, and the angel with the chalice at the foot of the cross suggest the late medieval devotion to the Holy Blood. 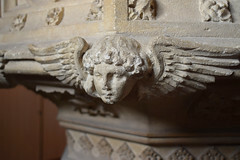 It is made of English alabaster, once a common object in an English church, but almost everywhere smashed up or sold off to the continent by 16th century hooligans. The colouring is modern, unfortunately. 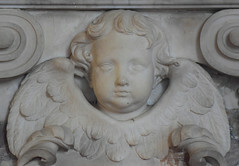 It was found walled up in the attic of a house in the village, and had been incorporated into a reredos by Geldart. This has now been dismantled. 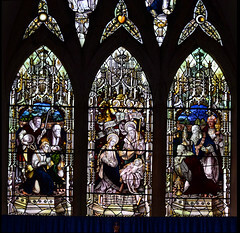 The 19th Century panels on the west wall of the nave also came from it. The roodscreen itself has gone; Mortlock, writing in the 1980s, observed that Cautley had seen it in pieces in the 1930s, but that he could not find it himself. Back in 2003 I found it stacked up against the south wall of the tower, behind some old benches. If it had really been there for three-quarters of a century, I couldnt say. Pevsner's revising editor found it 'not on display', and I couldn't find it now either. I suppose that there seemed little point in restoring it to its original position, the high altar is far enough away as it is without obstructing the view further. One of the more significant early modern inhabitants of Coddenham was the 17th century minister Matthias Candler. His firebrand Puritanism would have important consequences for Suffolk churches. 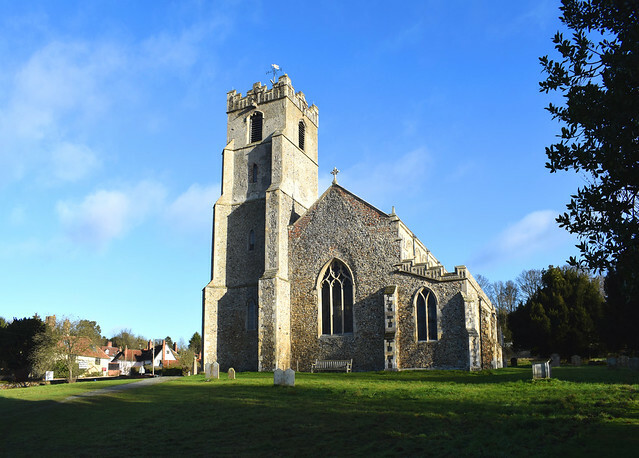 One of his congregation was the landowner William Dowsing, who had a house near this village, although it was actually just over the border in Baylham parish. Dowsing learned to be a thorough-going protestant at the feet of Candlers pulpit. In 1644, Dowsing would make a journey through Suffolk and Cambridgeshire on behalf of the Earl of Manchester, wrecking sacramental imagery in more than 250 churches. Candler died in 1663 while still Rector, which suggests that the Restoration of three years earlier had not been dramatic, or that Candler was a wily enough character to survive it. One wonders what Dowsing and Candler would make of the church of today - or, at least, of Ernest Geldart's efforts to resacramentalise the internal space. 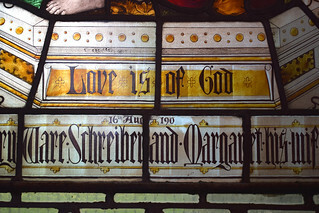 That long chancel would have them turning in their graves, I hope.